» Dance is a performance art form consisting of purposefully selected sequences of human movement. This movement has aesthetic and symbolic value, and is acknowledged as dance by performers and observers within a particular culture. » Dance in India comprises the varied styles of dances in the country. 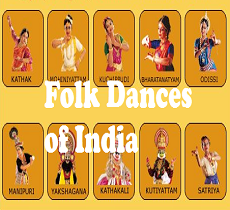 As with other aspects of Indian culture, different forms of dances originated in different parts of India, developed according to the local traditions and also imbibed elements from other parts of the country. » Sangeet Natak Akademi, the national academy for performing arts, recognizes eight distinctive traditional dances as Indian classical dances, which might have origin in religious activities of distant past. » Folk dances are numerous in number and style, and vary according to the local tradition of the respective state, ethnic or geographic regions. Kuchipudi (Classical), Ghantamardala, Ottam, Thedal, Mohioniattam, Kummi, Siddhi, Madhuri, Chhadi. Goudi, Karma, Jhumar, Dagla, Pali, Tapali, Navrani, Diwari, Mundari. Jhali, Chharhi, Dhaman, Chhapeli, Mahasu, Nati, Dangi, Chamba, Thali, Jhainta, Daf, Stick Dance. Bihu, Bichhua, Natpuja, Maharas, Kaligopal, Bagurumba, Naga Dance, Khel Gopal, Tabal Chongli, Canoe, Jhumura Hobjanai. Kathakali(Classical), Ottam Thulal, Mohini Attam, Kaikottikali, Tappatikali, Kali Auttam. Manipuri(Classical), Rakhal, Nat Rash, Maha Rash, Raukhat. Odissi(Classical), Savari, Ghumara, Painka, Munari, Chhau, Chadya Dandanata. Lavani, Nakata, Koli, Lezim, Gafa, Dahikala, Dasavtar Or Bohada, Tamasha, Mauni, Powara, Gouricha. Yakshagan, Huttari, Suggi, Kunitha, Karga, Lambi. Garba, Dandiya Ras, Tippani Juriun, Bhavai. Rauf, Hikat, Mandjas, Kud Dandi Nach Damali. Nautanki, Raslila, Kajri, Jhora, Chappeli, Jaita. Jata Jatin, Bakho Bakhain, Panwariya, Sama Chakwa, Bidesia, Jatra. Jhumar, Phag, Daph, Dhamal, Loor, Gugga, Khor, Gagor.